Recycle Computers, PCs and other IT Equipment with certified hard drive destruction. Convenient pickup services nationwide for computer recycling with certified e-waste recycling, IT Asset Disposition and on-site hard drive shredding. Computer Recycling just about anywhere in the world is made hassle-free together with our Certified Computer Disposal Services. Possibly the most impressive Corporations in The World request the very best Service and our Secure Computer Recycling Services exceed all of the various PC Recycling Programs. 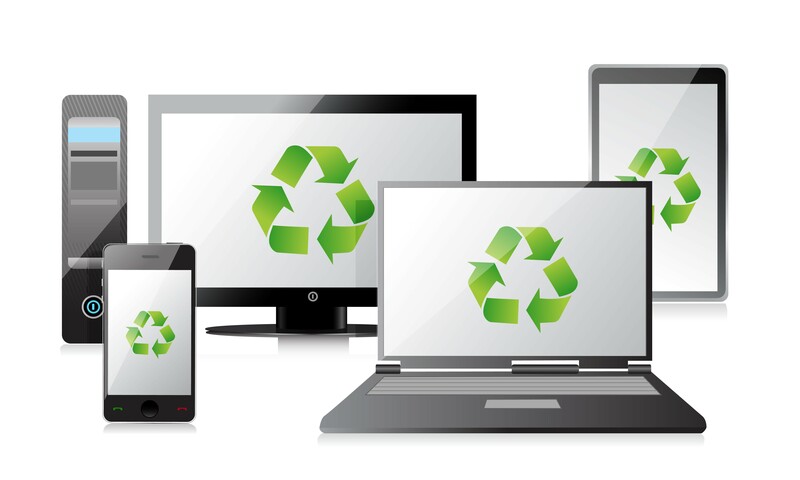 All Green Electronics Recycling is definitely invested in offering you superior computer recycling service. A computer contains a wealth of parts, made from thousands of different materials. Recycling, re-purposing or remarketing this equipment to stop it from going to waste into a landfill and polluting the environment is indeed a complex process, particularly if you are looking to do so economically, but at All Green Electronics Recycling we handle all of the process for you, making it incredibly simple. We are experts in Safe IT Equipment Recycling Services just about anywhere in The World though primarily within United States along with the the majority of North America. With our broad reach, we have a computer recycling center near you. All you have to do is call us to get a pickup scheduled for all of your IT Assets including computers, monitors, servers and tablets. A recently available survey of Fortune 1,000 companies demonstrated that All Green Electronics Recycling is the most dependable name for providers of Computer Recycling. Many people wonder where they can go for PC Recycle services. All Green offers PC recycling services and a lot more. Our recyclers will come to your facility to collect your computers, as well as any other recyclable electronics, carefully packaging and recording everything that was picked up. You will immediately be able to see your equipment appear on our central tracking system, and from this point on we’ll do all the work. Corporations that value Certified Computer Recycling Services choose All Green Electronics Recycling. Recycling computers with us is not only the best way to protect our planet but it’s also the best way to protect your data. Benefit from our Secure Computer Equipment Recycling Programs by Contacting us today in order to receive more information or to schedule your project.Your computers will be delivered to our secure facility. We take data security very seriously. If your computers contain hard drives or storage media we will perform a deep level of certified data destruction to ensure that any residual data is wiped completely. Our custom-built shredding equipment is the best in the business. Our clients include the Department of Homeland Security and the FBI. With our comprehensive reporting you can receive a certificate of destruction, releasing you from all risk and liability. Our Certified PC Recycling Solutions are helpful and effective. By using our Convenient Computer Disposal Programs, you can focus on what you do best while we do what we do best. If you are wondering where to go to recycle old computers, look no further than All Green. We are able to provide you with this services anywhere in the world. Certified Computer Recycling is what we do best. As per our comprehensive recycling plan designed to get the maximum use from your old computer equipment, we will now isolate items that can be separated into re-usable parts. Instead of indiscriminately shredding and separating items that be still be used, both fully or partially, we harvest and refurbish all reusable parts. You will be able to see this process in action in your All Green Electronics Recycling online management console. Importantly, All Green Electronics Recycling returns this revenue back to you. The world of technology is an amazing one, bringing entertainment, communication, and work solutions that were unimaginable a few decades ago. But with the purchase of every new device comes an old device that needs to be discarded. This leads to the question: What is the right way to dispose of old computers? Computers house a disturbing amount of toxic substances, including mercury, lead, cadmium, chromium, beryllium, arsenic, and antimony: all of which can cause gastrointestinal disorders, liver and kidney problems, or even cancer. For this reason, computers should never be thrown out with regular trash, as they’ll only end up in landfill and the toxic elements will begin seeping out over time, causing untold damage to humans and the environment. Instead, computers should be recycled, where competent recycling centers can extract up to 98% of usable materials. But with your obligation to the environment comes your duty to protect the data contained on your computer. As such, before recycling your computer, remove any media such as flash cards, memory sticks, DVDs, and CDs, then take a screwdriver and remove the hard drive. Your computer is now ready for recycling, and your hard drive is equally ready for hard drive shredding. Wondering How to Dispose of Computer Components? The world of technology moves at an alarming pace. It used to be the case that a car lost its new car feeling the moment it was driven out of the lot, but these days motor vehicles seem to last a lifetime compared to the average lifespan of a computer. Couple this with the fact that the prices of computers, accessories, and other electronic equipment continues to reduce as technology becomes outdated and superseded, and you have a generation of people who think nothing of updating their computers every two or three years. This has inevitably led to an unprecedented problem: how to dispose of computer components, accessories, and equipment that is being discarded at an alarming rate? Several options are available, yet most are risky at best and downright dangerous at worst (take the electronics dumping ground in China’s Guiya region, for example, which has become so polluted that no safe drinking water exists within a 30-km radius). Luckily, at All Green Recycling, we’ve solved the problem of how to dispose of computer components the right way. Click here to find out more. When it comes to computer waste, the figures are scary. The EPA estimates that American landfill already contains more than 2 million tons of computers and electronic waste. And with people continuously being encouraged to discard their old – albeit working, but nevertheless regarded as obsolete – computers in favor of the latest models, the question of how to recycle computers in an environmentally friendly way has never been more pertinent than it is today. While various methods of computer disposal exist, the key is to choose a way of recycling computers that benefit the environment, rather than causing further harm. Donating unwanted or obsolete computers can be a risky endeavor, as some donation schemes do little more than ship America’s computer waste to developing countries overseas. Indeed, the only way of disposing of unwanted computers, IT accessories, and other electronics is to use a method that will extract the greatest amount of raw materials from each device as possible. Read on to find out more. Trust All Green Electronics Recycling with our world-class Secure Computer Recycling Services and Benefit from the results. If you are thinking about where to recycle computers, call us today or click above in order to schedule a pickup. Not all computer parts can be reused, but virtually all parts contain recyclable elements that can be used to make 100% recyclable products. These computer parts we dismantle and separate. Comprehensive reporting is available at all times. Now your computer equipment is ready for disposition, whether redeployed in your organization, securely stored with All Green Electronics Recycling or sold through our large network of retail, wholesale and e-commerce re-sellers. As we evaluate and assess the condition of every computer part we are able to get the highest possible return from your computer equipment, and we pass these returns back to you. Your computers have been refurbished, recycled and re-purposed in the most economically and environmentally-friendly way possible. We at All Green Electronics Recycling have mastered our art and we encourage you to take action today. We love what we do and we enjoy providing our clients with Certified Computer Recycling Services. Recycle computers using All Green’s pickup or drop-off services and ensure that your data is safe and you are protecting our planet. We believe that using a one-size-fits-all recycling process only compounds the problem of computer disposal. We create with you a more comprehensive ITAD strategy that is both cheaper for your company and better for the environment. Re-purposing and remarketing equipment opens up revenue streams for outdated equipment, and recycling the precious metals from computers is another common strategy. As experts in this field, we are able to determine the best path to take when decommissioning your computers in a safe, secure and economically-viable way. It was less than twenty years ago that computers were seen as a luxury rather than a necessity. Now, computers are a vital part of everyday life for many people. With computer prices decreasing and new technology swiftly making otherwise near-new computers obsolete, the growing pile of unwanted computers continues to grow, with the world now being at the point where more than 65 tonnes of computer waste is generated every year. Without computer recycling options, computer waste poses a very real environmental problem. Computers, particularly older models, contain a host of dangerous, hazardous materials including lead, mercury, arsenic, and beryllium that, without proper recycling, can leak into water and the soil. To prevent these toxins from causing untold damage to the environment, a concerted effort to encourage recycling computers must be made. With the sanctity of your personal data our primary concern, the team at All Green Recycling can completely wipe and then refurbish your unwanted computers, making them available to individuals in need. For your peace of mind, a full audit trail, asset management register, and Certificate of Destruction are always provided to prove that your confidential information has been completely destroyed. Contact Us today for the best Computer Recycling Center Solutions in the industry. We are here to help ensure that Your needs are met. All Green Electronics Recycling is the top name in Secure Computer Recycling Services. How are we able to pick up your old computers at your location without incurring high costs? All Green Electronics Recycling operates the largest fleet of IT recycling trucks in North America. Conveniently arranged for any time, our recycling experts handle all of the packaging, labeling and removal of your outdated computers for you. You can even track where your computers are at all times through our state-of-the-art online management portal. Responsible computer recycling has never been easier. The disposal of computer equipment, which could potentially contain important data, is a responsibility that must be undertaken with the utmost care. With our long track record of certified integrity and assurance, All Green Electronics Recycling is the dedicated computer recycling company that most businesses trust on a daily basis. Every single asset that goes through our doors in carefully managed through every step, and all data is available transparently to you. Laws about computer recycling across the country mean that disposing of your computer equipment in an unsafe manner can leave you with huge fines large enough to cripple your business as well as irrevocably damage your reputation. Because at All Green Electronics Recycling we go above and beyond government minimum guidelines and ensure that a full 100% of items that come through our doors are recycled, your company is protected from risk, all the while offering a sustainable future for our planet. Hoarding computers and computer hardware is a common occurrence. The idea that certain components may be reusable in the future is a fair belief, but because of the exponential rate of hardware advancement, this idea may never come to fruition. When it comes time to clear closets, garages, and storage spaces of e-waste, many people throw their electronic devices into trash bins. Unfortunately, e-waste is highly toxic to the environment, and when it reaches landfills it will contaminate the environment. Let All Green Electronics Recycling recycle your computers in a safe and environmentally-sound way. All Green Electronics Recycling employees love to make sure our clients receive Certified PC Recycling Programs because we care about you. For more information, please be sure to contact us. We specialize in Computer Recycling so be sure to contact us with your questions.